We’re going WAY beyond Fathead Pizza Dough with these 9 different amazing ways to make keto pizza crust! I love a good Fathead Pizza Dough recipe as much as the next keto recipe blogger (see my Easier Fathead Dough With Coconut Flour here). But there are so many other amazing and delicious ways to make keto pizza crust! This recipe is super similar to how I make my own meatza crust at home. If you’re new to keto, meat + pizza = meatza, and it’s a delicious way to make keto pizza. I missed out on meatza for years because I was so sure that it would just be like eating a thin burger that I didn’t even try it. I’m telling you, it’s completely different, so don’t skip it like I did. If you are eating higher protein, this is an especially great crust to make. Not to mention that ground meat is almost always a more economical choice at the grocery store. Don’t let the word casserole fool you! Low Carb Yum’s Pizza casserole reminds me of one of those thick, deep dish pizzas, and this recipe has a reputation of winning over picky high carb eaters. I absolutely love how crazy easy it is, and it’s even a great way to get a few more eggs into your family’s diet. 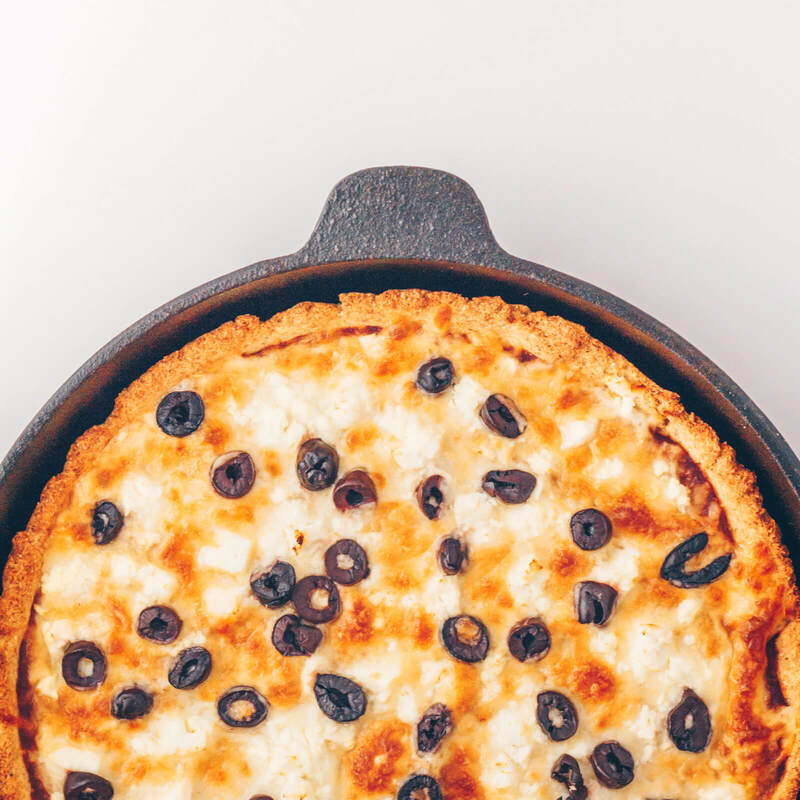 Nearly 100% of cauliflower pizza recipes on the internet tell you to put your cooked cauliflower rice in a dishcloth and squeeze out every last drop of liquid. Literally why I completely swore off making cauliflower crust! Such a pain, and my dishcloth never smelled the same again! Brenda from Sugar-Free Mom just gets me – she’s got a completely different way of dealing with the liquid issue in her keto cauliflower pizza crust recipe. This is a dairy free crust cooked completely on the stovetop, and it’s made with almond flour and coconut flour. This has me thinking about throwing the skillet right on the grill to cook and topping the pizza with some delicious grilled veggies! Yum! 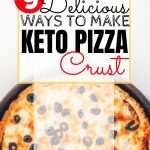 Martina at the Keto Diet Blog makes an incredibly useful dough with her Low Carb Tortilla recipe that makes about a million different things, including pizza dough. It sets itself apart from other recipes by using a variety of ingredients, including chia, flax, psyllium husks, coconut flour, and almond flour. This results in a dough that holds together well and won’t drive you nuts when you roll it out. If you want to try a yeast-risen keto pizza crust, I highly recommend Gnom-Gnom’s Paleo & Keto Pizza Crust Recipe. I substitute ⅔ Cup coconut flour in place of the almond flour the recipe calls for (since I’m sensitive to almonds), and I even cut the honey down to 1 tsp, and the recipe still turns out great every time! If you’ve tried the pork rind crust in my Eggnog Latte Cheesecake or Peanut Butter Cheesecake recipes, you know that pork rinds are basically the cauliflower of the keto baking world. Leave it to Sam at Hey Keto Mama to create a low carb pork rind pizza crust! I mean come on, how fun is that?! These aren’t just for lunch or dinner, they’re also a great snack option. Since there’s no crust to mix up or prebake, these are super fast to make any time you need a little something. Not to mention another way to sneak in some veggie variety! Alright, so this last one does involve Fathead Dough, but I’m sure you’ll forgive me when you see the super fun and unique twist Kyndra at Peace Love And Low Carb puts on pizza with her Fathead Pepperoni Waffle Pizza Dippers! She actually cooks them in the waffle iron! These are so fun and delicious for a party, and kids will love them too (perfect after school snack!). These freeze really well, so make a big batch and then you can reheat a few in the oven as you need them. WANT MORE DELICIOUS KETO PIZZA IDEAS? FOLLOW THE BAKE IT KETO DINNER RECIPES BOARD ON PINTEREST!